BUTLINCAT's BLOG: Something STRANGE is occurring at the SAME depth below the earth's surface! + STRANGE WAVES RIPPLED AROUND THE WORLD - WHY? Something STRANGE is occurring at the SAME depth below the earth's surface! 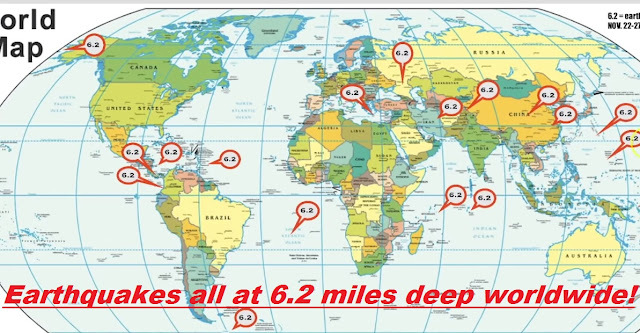 + STRANGE WAVES RIPPLED AROUND THE WORLD - WHY? Something STRANGE is occurring at the SAME depth below the earth's surface! The seismic waves began roughly 15 miles off the shores of Mayotte, a French island sandwiched between Africa and the northern tip of Madagascar. The waves buzzed across Africa, ringing sensors in Zambia, Kenya, and Ethiopia. They traversed vast oceans, humming across Chile, New Zealand, Canada, and even Hawaii nearly 11,000 miles away.These waves didn't just zip by; they rang for more than 20 minutes. And yet, it seems, no human felt them.Only one person noticed the odd signal on the U.S. Geological Survey's real-time seismogram displays. An earthquake enthusiast who uses the handle @matarikipax saw the curious zigzags and posted images of them to Twitter. That small action kicked off another ripple of sorts, as researchers around the world attempted to suss out the source of the waves. Was it a meteor strike? A submarine volcano eruption? An ancient sea monster rising from the deep? Why is wombat poop cube-shaped? global spread. And researchers are still chasing down the geologic conundrum. EARTHQUAKES 101Earthquakes are unpredictable and can strike with enough force to bring buildings down. Find out what causes earthquakes, why they're so deadly, and what's being done to help buildings sustain their hits. Since mid-July, GPS stations on the island have tracked it sliding more than 2.4 inches to the east and 1.2 inches to the south, according data from Institut National de L’information Géographique et Forestière. Using these measurements, Pierre Briole of the Ecole Normale Supérieure in Parisestimated that a magma body that measures about a third of a cubic mile is squishing its way through the subsurface near Mayotte. Maya Wei-Haas is a digital science writer for National Geographic.